According to The Lust Quotient, we are supposed to separate from our partners, albeit temporarily, to keep romance alive. I could say that’s why I just returned from a trip to Paris with a girlfriend, but it’s not the whole truth. We went on a culinary quest. Slowly, but surely the details will emerge on JC. I mean about the food —not about my relationship. And speaking of lust — The first thing I reach for when I need a pick me up is dark chocolate. Whatever is bugging me dissolves after just a few bites. Check out this Grownup Serious Chocolate and see how low you can go in the sugar-fat quotients to get the mature chocolaty taste aficionados crave. In a large bowl, placed over a pot of boiling water, heat the coconut oil, chocolate, vanilla, and salt, until it melts. 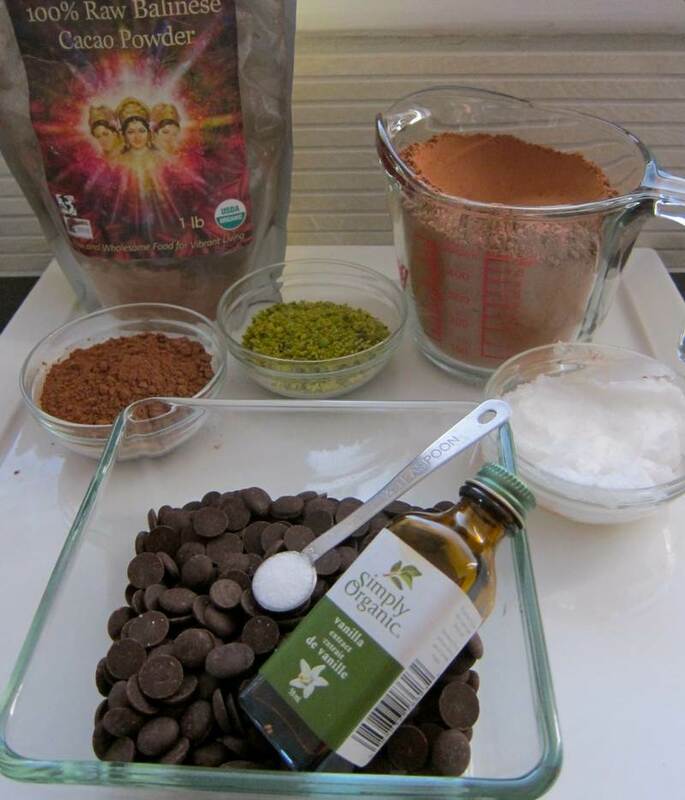 Mix well, then stir in 1 3/4 cups of the cacao powder gradually until thoroughly combined. Taste as you add sweetener, using less if you like that serious dark chocolate taste. Place the bowl in the refrigerator for about 10 minutes to set slightly. Cover a small baking tray with parchment paper. 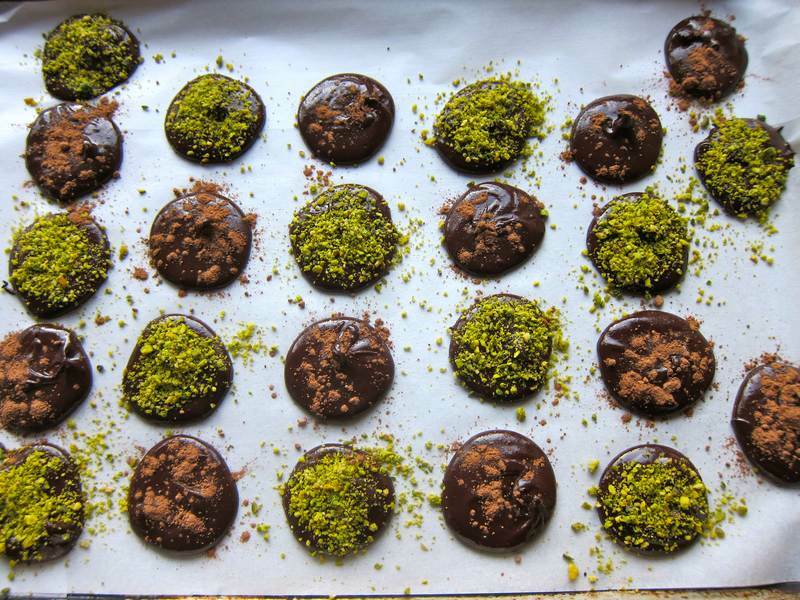 Use a small spoon to dole out 36 flat chocolate discs, spacing them so that they don’t touch. 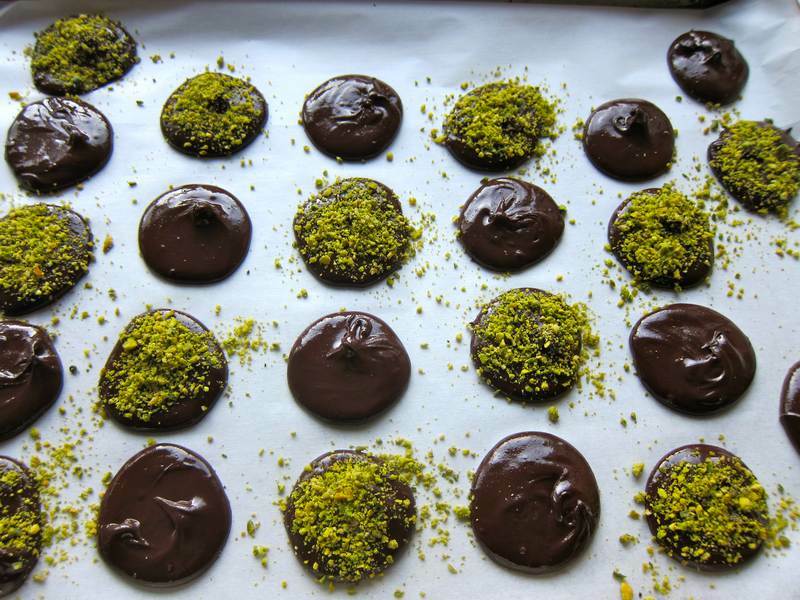 Sprinkle them with pistachio or cacao powder. Freeze and remove from the freezer 5 minutes before serving. Serve alongside strawberries or clementines. With this many related articles, who needs final notes? « Wild Garlic Omelette – Ramp it Up! 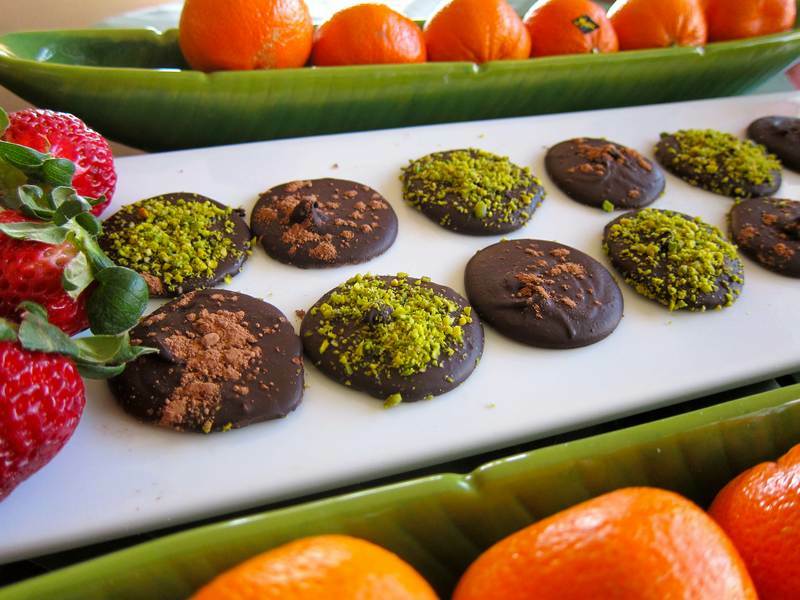 Homemade chocolate discs and Clementines. Now you’re talkin’ my lingo. Looks great. Thanks for the sweet tip. I’ll give it a go soon. Great to hear from you! Reminds me to head on over to the Palladian Traveler to see what you’ve been up to. It’s a sweet tip with as little sweetness as adult palates can handle to keep it healthy and satisfying at the same time. OMG I’ve been waiting and waiting for these. These are heaven in a bite. Welcome Christina. Looking forward to our cooking date. Great way to get your chocolate fix! Agreed! Thanks for liking Jovina. These are so beautiful looking!